Tag line: "Of all the major studios, one was family"
Back when Warner Bros. was actually run by brothers (namely Harry, Albert, Sam and Jack), the studio turned out some of the finest movies ever made, including The Adventures of Robin Hood, The Treasure of the Sierra Madre, and Bonnie and Clyde. Directed by Cass Warner Sperling (Harry Warner’s granddaughter), The Brothers Warner takes us from the early days in New Castle, Pennsylvania, when the Warners first broke into the movie business by way of a Nickelodeon theater, to the formation of their studio in Hollywood. Along with the history, we also take a look behind-the-scenes, learning about the sacrifices and family squabbles that helped transform Warner Bros. into a cinematic powerhouse. From the beginning, the motto of Warner Bros. studios was “Educate, Entertain, Enlighten”, and as a result, many of their early films dealt with socially relevant issues. Aside from shining a light on organized crime (The Public Enemy, Little Caesar), the studio released I Am a Fugitive from a Chain Gang in 1932, a movie so powerful that it led to various prison reforms throughout the United States. Not everyone saw the studio’s social consciousness as a good thing; 1937’s The Black Legion, about an underground society terrorizing immigrants, resulted in a lawsuit brought against Warners by the Ku Klux Klan, and a planned 1935 film titled Concentration Camp, which would have tackled what was going on in Nazi Germany at the time, was nixed by the Production Code, and therefore never made. Along with their "message" films, the Warners were also pioneers in the industry. It was Sam Warner who recognized the potential for bringing sound to the movies, and oversaw the production of 1927’s The Jazz Singer, the first motion picture ever to feature spoken dialogue (in a tragic bit of irony, Sam Warner died of a cerebral hemorrhage two days after the New York premiere of The Jazz Singer). And, of course, who can forget the studio's great cartoon series, Looney Tunes, which turned Bugs Bunny and Daffy Duck into household names? The Brothers Warner also delves into the brothers personal lives by way of home movies and interviews with members of the family. Like all siblings, the Warners had their troubles; Harry, the eldest, was a strong businessman who objected to younger brother Jack’s outgoing, sometimes scandalous lifestyle (in the mid-‘30s, Jack divorced his first wife so he could marry his mistress, a move that angered many in the family). Towards the end, Harry and Jack had stopped talking, leaving brother Albert to act as a go-between, delivering messages from one to the other. It stayed like this right up until the time Jack Warner stole the studio away from his brothers, a move that essentially broke Harry’s heart. 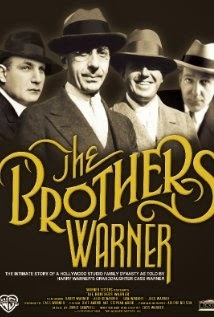 Both an in-depth look at the history of a major studio and a personal account of one family’s trials and tribulations, The Brothers Warner is a well-made, very informative documentary.